Seriously though, Sir Mix-A-Lot aside, I eat protein pancakes on a daily basis. They're my non-guilty pleasure. Sometimes I think I need to be a maple syrup conglomerate (like Vince Vaughn in Wedding Crashers). 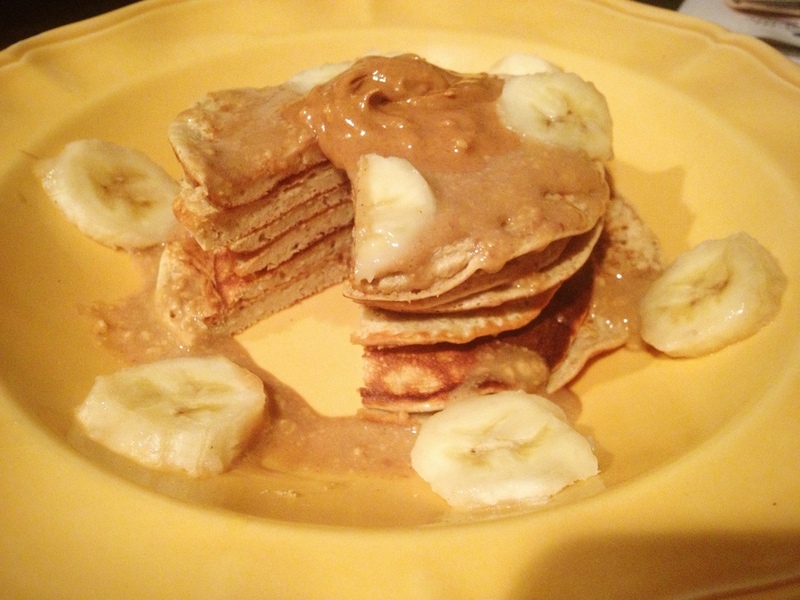 Here's my new favorite, moist and fluffy protein pancake recipe: peanut butter and banana. Classic. Combine all of the batter ingredients into a blender or food processor. Blend until mixed and a pancake batter is formed. Pre-heat a nonstick pan on medium and spray coconut oil cooking spray lightly (not too much because remember those are not calorie-free. The labels are deceiving, so spray only what you need.) Pour 1/6 of pancake batter onto pan. When the pancake starts to form bubbles on top, it’s ready to flip! Each side should only cook for about 1 to 2 minutes. Repeat to make six small pancakes. For the topping, stir PB2 into the syrup and microwave for 15 seconds. Stir again. Stack the pancakes, pour on PB2 syrup mixture and top with the all-natural peanut butter.